“Quantum dots are nanometer-sized boxes that have attracted huge scientific interest for use in nanotechnology because their properties obey quantum mechanics and are requisites to develop advanced electronic and photonic devices. Quantum dots that self-assemble during their formation are particularly attractive as tunable light emitters in nanoelectronic devices and to study quantum physics because of their quantized transport behavior. 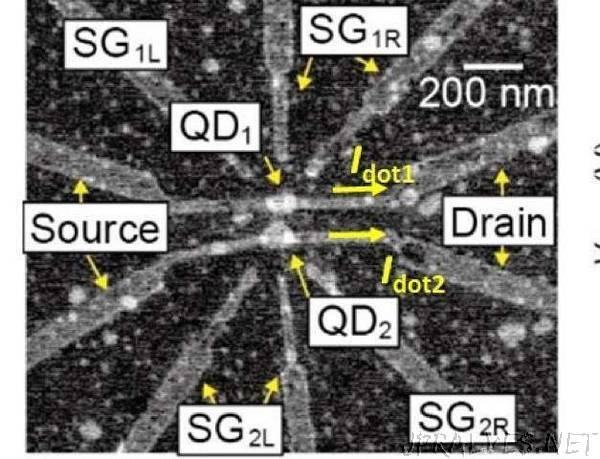 It is important to develop a way to measure the charge in a single self-assembled quantum dot to achieve quantum information processing; however, this is difficult because the metal electrodes needed for the measurement can screen out the very small charge of the quantum dot. Researchers at Osaka University have recently developed the first device based on two self-assembled quantum dots that can measure the single-electron charge of one quantum dot using a second as a sensor.